Now, you can play pool anywhere. Our Mini Pool Table sits comfortably on any table top and provides endless fun for the whole family. It is constructed from solid wood, elegantly lacquered and finished with sturdy green felt top and high quality net pouches. 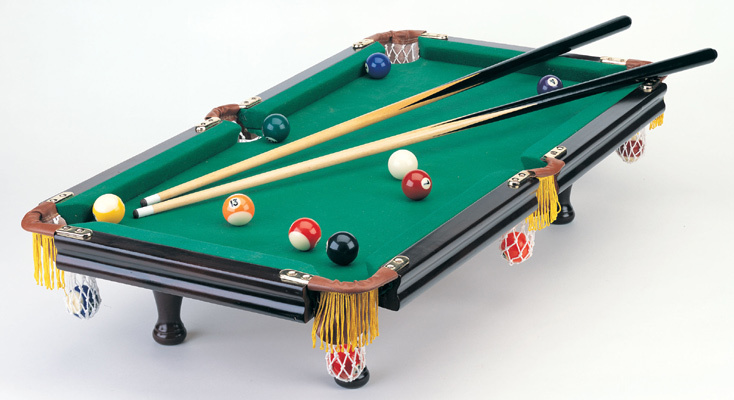 The table comes complete with all accessories required for playing, including a set of Pool Balls, two 36 inch Pool Cues, brush for cleaning and maintenance of the felt, chalk cubes and Ball Rack. The table measures 36 inches in length, 20 in. wide and 8 inches in height.